Already started taking sign-ups? Have no fear! We can import members! If you have more than 50 members already signed up for your season, we can import them into your system for you. ﻿Complete the Import Spreadsheet and send it to a Farmigo Technical Advisor. See instructions for downloading and completing the spreadsheet below. Click one button below to download the spreadsheet template. You may download the template as a CSV file or Microsoft Excel file. Follow the steps below to complete the template then send it to your Technical Advisor at support@farmigo.com. Open the file in MS Excel or in another spreadsheet program. Do not change the order of the columns - they must remain in the order displayed. Read the Instructions in Row 1 of the spreadsheet. These instructions explain which columns are REQUIRED and which are optional as well as what should go in each column. Please don't change anything in rows 1 or 2. Row 3, however, is a dummy record entered for the purposes of example. If you like, you can leave this row in and we will delete it before we import your member records. pickupSite = Location titles that you added from the Routes manager in the dashboard. Make sure that each location has a unique title to differentiate itself from the other locations entered in your system. subscriptionType = The titles of shares and options entered from the Items manager of the dashboard. schedule = The name of the schedule that has been entered from the Settings links of the dashboard. After your members have been imported into your Farmigo system, we recommend that you reach out to your members to inform them of their Farmigo account and ask them to confirm their account details. From the dashboard, go to Settings tab and click + New Template. You may use and edit the following recommended text. 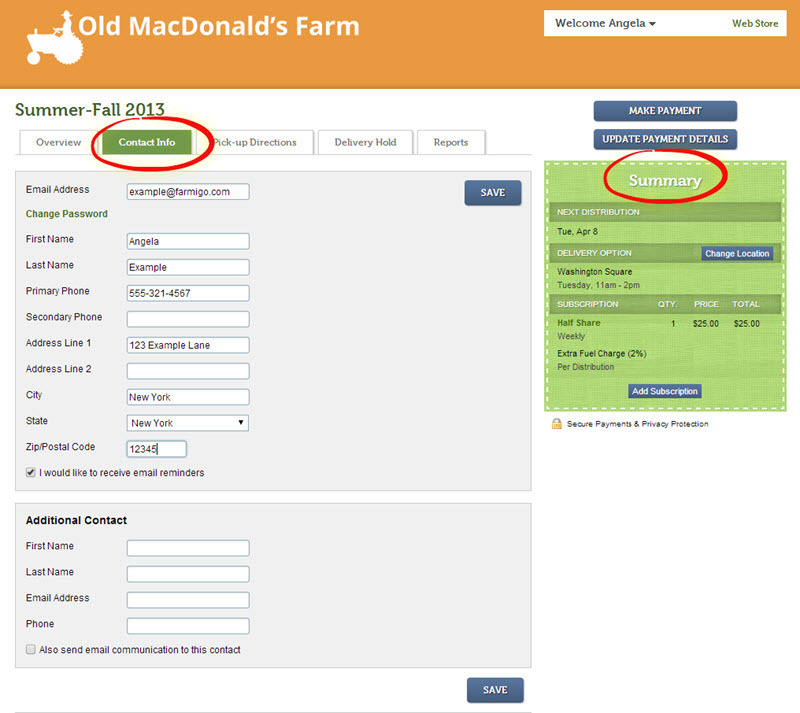 To give you easy access to your CSA account online, we have begun using Farmigo - a CSA management software program! - For the first time that you log in, you will be asked to create your personal password. - Click the Contact Info tab in order to update and confirm your contact details. - Check out the green summary box in order confirm the details of your subscription with us. Please reply to this email if you have any concerns. Please let us know if you have any questions by replying to this email. We look forward to interacting with you using Farmigo! Select the template that you created, edit if needed, and click Send!